1. Do NOT support Western Digital (WD) Hard disk drive,please note that! 2. Support capacity up to 6TB. 3. One button backup function (need to install the software in the CD driver). 4. We will repackage this item to reduce shipping weight paper and bag waste. 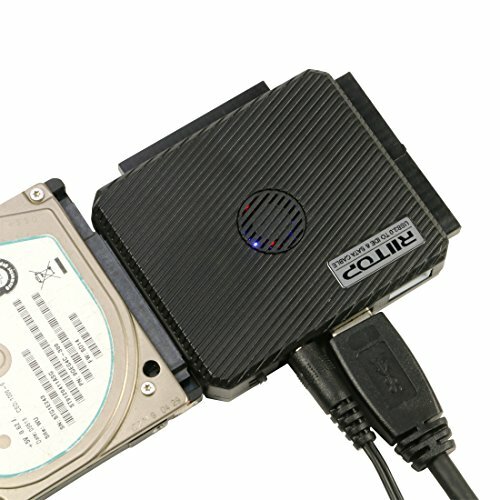 USB 3.0 to SATA/IDE 2.5/3.5/5.25-inch Hard Drive Converter Adapter With Power Supply & LED Activity Lights. Supports Standard Desktop 3.5" SATA or IDE Hard Drives. Supports Standard Notebook 2.5" SATA or IDE Hard Drives. LED Lights indicates Power and Activity Status. Super-Speed USB 3.0 interface, Reverse compatible with USB 2.0 and USB 1.1. One button backup function (need to install the software in the CD driver),LED lights indicate Power and Activity status. With 12V/2A high quality power adapter,support capacity up to 6TB. On/Off Switch for HDD protection, can be switched off when not in use, easy and simple operation, efficiently enhances lifespan of your devicesit can protect your HDD. Available USB port port on the computer. Windows: 2000/XP/Vista/7/8/8.1/10 (Both 32-bit and 64-bit versions). Easy installation, no need tools,LED indicator for power and disk access. 12V/2A Strong and Stable Power Adapter US Plug. If you have any questions about this product by RIITOP, contact us by completing and submitting the form below. If you are looking for a specif part number, please include it with your message.